To many, social interaction through these applications has become integrated into their everyday communication, for instance Facebook, and many recent social media platforms, such as for example Instagram and Snapchat, have been specifically developed as mobile phone applications. As use of these mobile social applications is increasingly common and part of our social lives, the distinction between being online and offline is becoming more and more vague. Smartphones are by their nature communication devices that simplify interaction between people in a number of ways. This is also true for learning communities between beekeepers and sub-groups within this sector. These learning communities, where people interact based on a common interest, are more and more important as a tool for adult, informal learning. ICT: Information – and Communication Technologies is an another/extensional term for information technology (IT) which stresses the role of unified communications and the integration of telecommunications, computers as well as necessary enterprise software, middleware, storage, and audio-visual systems, which enable users to access, store, transmit, and manipulate information. The health care service with applications as “Online doctor services” could serve as an example of new technology that through smartphones and better online connections work well. You register for an appointment, describes your issues and you get a video consultation for approximately 15 minutes and you pay as for a regular doctor visit. It is important that you have a personalised adapted form/service to get credibility and preservation of personal integrity. Open Educational Resources, OER, where educational material are made public and can be reused by others than the authors. It is like a smorgasbord where you can pick what you want, and adapt to your local situations and target groups. ICT has the potential to reach a broad audience in a cost-effective manner, as well as to share useful information in real time as support for the customer’s decision. But while ICT creates new platforms for learning and information sharing, they will never be able to completely replace social networks based on the physical encounter between people. 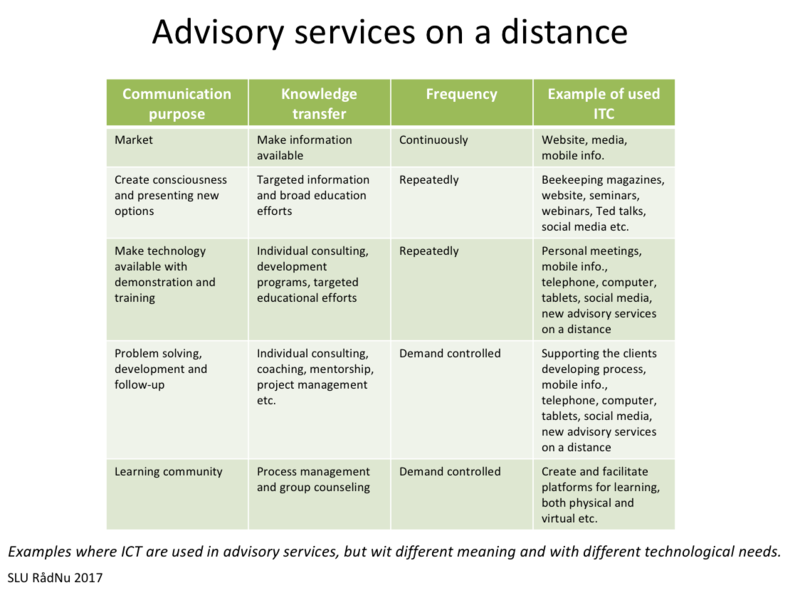 The question is rather how personal networks and new applications of ICT, such as distance consulting, can create customer benefits and at the same time support and be a complement to each other.